Any issues during your pregnancy? During my 32 week appointment, my doctor was giving me a NST just to check things out since I had been feeling a little “off” that day. It turns out, I was having contractions every 2 minutes but wasn’t dilating and my cervix hadn’t changed. At that point, I was so huge and my belly was so tight all the time, I honestly had no idea I was having such regular contractions. I checked into L&D where they attempted to slow them down with an IV of fluids for a few hours. They slowed down to every 5-7 minutes, which wasn’t going to get me out of the hospital anytime soon. I ended up getting a Magnesium drip for 24 hours (which was worse than actually giving birth, in my opinion!) Once that was complete, the contractions stopped. I was discharged from the hospital and took Procardia every 6 hours for the rest of my pregnancy to help keep the contractions under control. It was at this point that I was also put on home bed rest. I continued working from home for the next 3 weeks. Memorable/funny moment when you were pregnant: When I was 12 weeks along, my husband and I went to the last Texas A&M vs. UT football game in College Station. Since we both graduated from A&M (and Trey played football there for 4 years), we are HUGE Aggie fans and were lucky enough to get amazing tickets to the game. Being in the last few days of my first trimester, I was not feeling up to it, but decided to make the trip anyway. 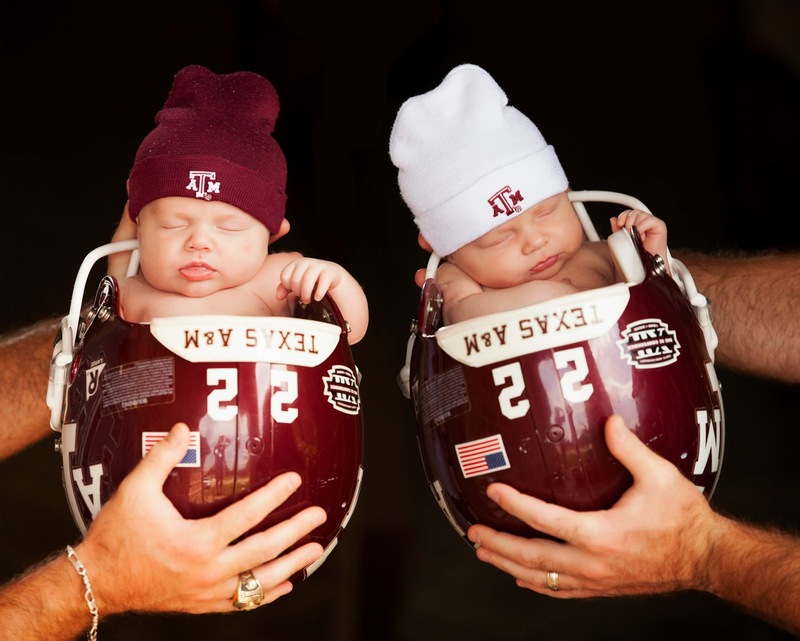 Our little Aggie babies NEEDED to go to this monumental game, of course! Well, by the time the game started that night, I was exhausted from a full day of tailgating. It was freezing cold, drizzling, loud, and I was starving. The thought of eating the stadium food (hot dogs, cold nachos, greasy popcorn, etc.) was making me nauseous. The game was exciting and the score was close, but all I was concentrating on was not throwing up in the stands! I ended up wrapping myself in a blanket and closing my eyes to try and zone it out while the crowd around me was going wild in the end zone. I ended up falling COMPLETELY asleep for the last quarter, and I woke up once the game was over and the Aggies had lost. Apparently the game went down to the last second, and I missed all of it! Looking back, what is one thing you would tell your pregnant self? I would tell myself to just ENJOY my pregnancy more. With this being my first, I didn’t want to do anything “wrong” that could jeopardize things. “Did I warm my lunch meat up enough?” “Are these fumes too strong at the nail salon?” “Did the dog bump into my stomach too hard?” I was just so protective over these babies, sometimes to an excess that it became stressful! Pregnancy is such an amazing time to experience the power of God’s creation, and we should cherish every special moment. Did you have a c-section or natural delivery? On May 5, my water broke at home (while I was going to the bathroom- how convenient!) I checked into the hospital about 6:00 PM. Around 9:00 PM, I got my epidural and slept like a baby the entire night! It was the best night of sleep I had gotten in a very long time because I finally couldn’t feel the weight of my massive belly! The nurses came in throughout the night to check my progress, but I easily fell back asleep each time. That epidural was GOOD stuff! At 4:00 AM, the nurse announced I was dilated to a 10 and it was time to meet these babies! The nurses wheeled me to the OR where I would deliver. The plan was to have a natural birth, but the doctor wanted me to be in an OR just in case there were any complications that would warrant a c-section. I pushed for 45 minutes but didn’t make too much progress. The doctor suggested using the vacuum while I pushed in order to get things moving. During the next push/vacuum, out came my big baby Case! The nurses then grabbed Cannon from the outside of my belly so that he wouldn’t turn/flip since he now had so much room without his brother inside. They helped him slide right over while staying head down and in position. And yes, it felt as weird as it sounds. The doctor also used the vacuum for Cannon, and he entered the world one push and 6 minutes later. Any NICU time? If yes, for what reason and how long? No, the boys didn’t require any NICU time after delivery. However, when they were 5 days old, they were admitted to Children’s Hospital in Dallas for 2 days. They were not sucking effectively (the pediatrician said they were using me more as a pacifier) and both had lost too much of their birth weight. Cannon’s bilirubin levels had also risen, so he stayed under the UV lights for 24 hours. I started pumping/supplementing with formula and exclusively bottle feeding so that we could measure exactly how much they were getting. The boys quickly gained back the weight plus some, and we were released on Mother’s Day. That was a good present for my first one! We charted feedings and diaper changes for several months after that. When the boys were 4.5 months old, they each wore a DOC Band for 8 weeks to help correct their plagiocephaly. Did you have any complications after delivery? No complications per say, but I was NOT prepared for the amount of bleeding afterwards (that continued for a few weeks). We were good first time parents and attended the child birth class at the hospital, and I swear they did not cover this!!! It was such a process to go to the bathroom, use the spray bottle to rinse, put on the world’s biggest pad, and pull on the “one size fits all” mesh underwear. Did your twins stay with you or in the hospital nursery at night? The boys stayed in the hospital nursery at night, and the nurses brought them to us for feedings. It was crazy how we already missed them when they were gone for 2 hours. But I am glad we could store up a few extra minutes of sleep before we went home. 1. I wish I had brought one of my own bath towels- the towels at the hospital were pretty much glorified hand towels. And very scratchy! 2. I am glad I brought a loose, comfy cardigan. It was easy to just pull that closed over my nursing tank when we had visitors, not to mention it was always cold in the room. 3. Semi-related to bath towels, I am glad I brought my razor. I was oddly excited to be able to really shave my legs without a belly in the way! Describe one of your favorite moments while you were at the hospital: The hospital I delivered at, The Medical Center of Plano, gave all new parents vouchers for a free “Celebration Meal” to use during your stay. We chose to eat ours the night before we were discharged. It was actually really good- steak, lobster, asparagus, mashed potatoes, and a huge piece of chocolate cake. Like legit restaurant good. I remember my husband was sitting in a chair, and I was on the side of the hospital bed. We had the tray rolled up between us as our table. We just sat there eating our meal with the babies sleeping beside us in their bassinets. I just felt so happy and complete in that moment. Our family was finally here! If you had one piece of advice you could give an expecting mom of twins, what would it be? Schedule, schedule, schedule! It made my life so much easier to know when things were going to happen (feedings, naps, diaper changes, fussy times, baths, etc.) During those early months when you are so sleep deprived, having a set, written schedule to follow is a life saver. Make sure that each baby is doing the same thing at the same time. It is now almost two years later, and we still are on a schedule (maybe not AS strictly). It has made every aspect of raising twins easier. Love reading a story from another Aggie! Your boys are adorable! Squeee!! Twin aggies! Ours are future class of '35 and I can't wait to bring them to tailgate at a football game this year! !